insinuates itself into literature w the necessity to title. engagement with a smaller amount of text. water releases an offensive smell. Manuscript is ms.
For us, the difference between capitalism and community, between products and ideas. Feminism is about pay equity, access to affordable childcare, improving transgender health care, showing solidarity with all systematically marginalized groups. But it’s also about ideas. In the saturated publishing market, how can we treat women’s ideas with dignity and not as products? The difference between so-called political feminism and marketplace feminism seems to mirror that between communal goals and individual success. A handful of successful women and trans writers doesn’t itself make gender equity. Spaces where a broad range of ideas and expressions are valued and celebrated just might though. Feminist attitudes in this issue treat poetry’s capacity to engage the always-already political. Hoa Nguyen’s work, for example, often treats domestic and political space as one and the same. Amanda Earl’s poem address city planning and the legacy of Jane Jacobs by questioning the very coherence of subjectivity in place. Klara du Plessis dissects categorization by asking, “how the fundamental procedure of naming / insinuates itself into literature w the necessity title.” In shifting our gaze from consumer choice to aesthetic inquiry, how can our ideas give shape to meaningful exchange? 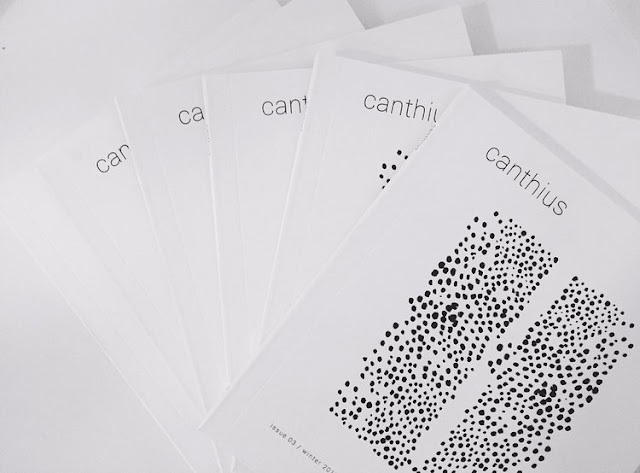 Part of the strength of Canthius is its attentiveness to both the formal lyric and the experimental, and all spaces around and in-between, side-stepping any sense of aesthetic-as-limitation. Canthius is a journal open to content, conversation and collusion, seeking out what might not have been considered, otherwise. There really is some amazing work in this issue, from Amanda Earl’s city-poems, “Grace,” to Klara du Plessis sharp and precise lyric narratives and Doyali Islam’s powerful asides to Nicole Brewer’s expansive staccato-lyric “It Started With the Socks” (perhaps the first I’ve seen of her work, actually). Toronto poet Hoa Nguyen’s work, obviously, is simply magical for its lyric flow and focus on smallness, writing “A place of purple of / Lip balm / Empty breath spray [. ]” As well, I’m intrigued by the introduction to work by Ariel Dawn, poetry by fiction writer Nancy Lee and even Brewer, whom I’ve been aware of for some time but hadn’t yet seen the work of. There is an awful lot here to take in, and wonderfully so.